- Thank you Mr. Bun! We are not being encouraged. We are being taunted. Everybody knows that, right? Mr. Bun looks very distinguished, and wise. However, it was a bit harsh for me as a M*nd*y-hating hoomin to be told "It's nearly Tuesday" when it wasn't! We hoomins who have to go to work Disapprove Of Mondays! Uh oh, am I the only one seeing a resemblance to Alfred Hitchcock's silhouette in this image? I shudder to think of the terror one such as Mr. Bun would be capable of creating on the Big Screen. 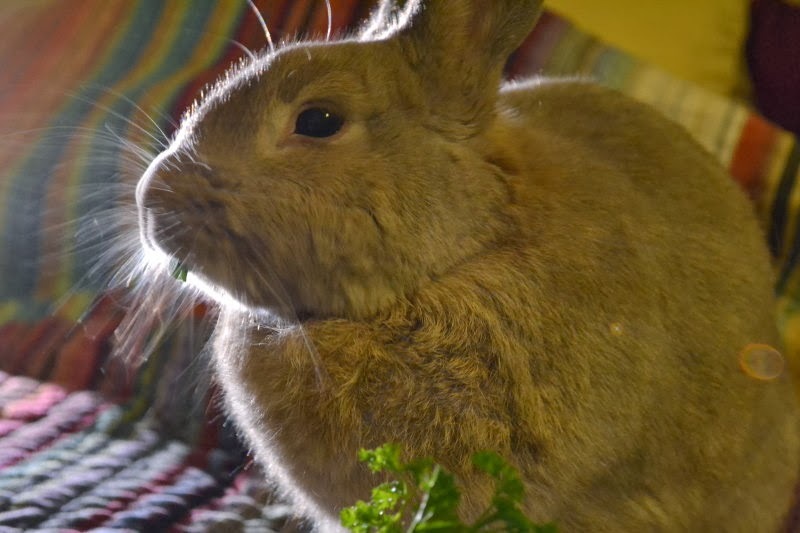 Fleetie, perhaps you should enjoy a parsley sprig to brighten your outlook. Rachel, at least there is one thing nice about today, and that is that it is your birthday. Was that really your birthday cake? I am still crying over the Christmas cake. On a more serious note, I had no idea the flooding was so bad in the UK. I don't know how I missed it, but I saw some pictures today that I could not believe. You all over there be okay! The bunnies here in Texas want you to know that they REALLY disapprove.